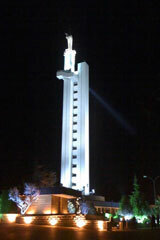 Located on a hilltop to the Southwest of Zahlé, this is a 54m (177 ft) high concrete tower, entirely clad in white marble, and topped with a 10 m (33 ft) high bronze statue of the Virgin Mary, the work of an Italian artist. It is by far Zahlé's most prominent structure, and is visible from practically every spot in town, as well as from several miles around in the central Bekaa Valley. At its base a chapel that can seat a little over of a hundred people. The top of the tower features sweeping views over Zahlé and the Bekaa valley. In 1958, Bishop Euthym, a man of great devotion to Our Lady, decided to build a shrine in honor of the Virgin Mary on the top of a hill overlooking Zahle and the Bekaa Valley.